a school drop-out, having left home and school at 16 due to economic challenges, she picked up her schooling later and went on to nursing, a university degree and many additional courses. Coming to Canada in ’63 she “did all kinds of nursing from public health to pioneering a family planning clinic”, many of which required special studies. Describing herself as a “late-bloomer”, she moved from her Church of Scotland roots into the United Church and attended the Centre for Christian Studies. A visit to the Convent suggested by a monk friend found her “very drawn to the place” and caused her to stay an additional 11 weeks that summer. “It didn’t take long for me to know I was being called to come here”. 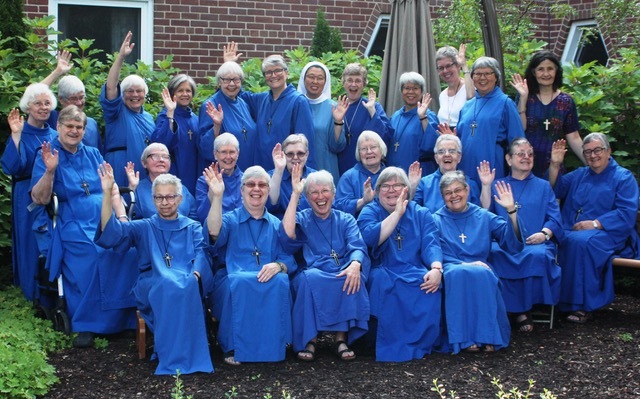 Sr. Frances Joyce said “stay close and come often”. 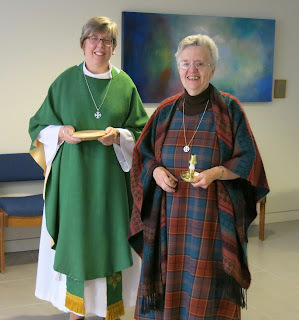 The turning point, Sr. Jessica realized, had been a course on Christian Holiness that opened for her the monastic tradition; “a whole new life introduced me to sacramental theology”. It all became an incredible awakening and couldn’t get enough of me”. On her first desert day, while journaling, she was suddenly aware of being a Christian for years “and now living the Gospel with people you wouldn’t necessarily choose – the gift and the difficult of living and working together”. All her jobs had challenging times when she questioned her vocation: “I don’t want to blow this. I remember crying over the laundry…. We had a golden opportunity in this life to look at ourselves every day through the scriptures, retreats, reading, etc. I loved doing the chapel and the infirmary (looking after the souls and bodies of the Sisters! Aren’t I privileged! ), and with such dedicated help. Maybe I’ll be a late-bloomer in heaven too”.